Recognizing Powdery Mildew – Take a close look at this photo of a squash leaf in my garden. Powdery mildew looks like splotches of white or gray powder on the leaves and stems of plants. There are several types of powdery mildew fungi, but they all look the same. You may not notice a problem until the top surfaces of the leaves turn powdery, but powdery mildew can also affect under- leaf surfaces, stems, flowers, buds, and even the fruits of plants. Although powdery mildew is unattractive, it rarely is fatal. It does stress the plant, and severe or repetitive infections will weaken a plant’s health. If enough of the leaf surface becomes covered with powdery mildew, photosynthesis is impaired. Infected leaves often drop prematurely. This can be a particular problem on edible crops since insufficient photosynthesis can diminish the flavor of the fruit or vegetable. If buds become infected, they may not mature or open at all! Mildew is Host Specific – Powdery mildew fungi are host specific, meaning that different powdery mildew fungi infect different plants. The powdery mildew on your lilacs will not spread to your grapes or your roses. . . Cause and Effect – Powdery mildew fungi seem to be everywhere. They overwinter in plant debris and begin producing spores in the spring. These spores are carried to our plants by wind, birds, insects, and splashing water. All powdery mildews thrive in the same conditions. 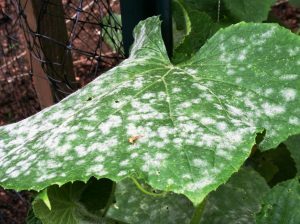 The growth and spread of powdery mildew are encouraged by dampness, high humidity, poor air circulation, and crowded plants in the garden. In the mountains of Arizona, all of these conditions appear at the start of our monsoon season! Controls – First and foremost choose healthy plants. Healthy plants are less likely to become diseased and are able to fend better for themselves if an attack happens. Good to know that there are plants being bred to be more resistive to mildew. Whatever you do, don’t plant non-resistant varieties in shaded areas with poor air circulation! Infected Plants – Just a little attention and care will fend off pesky powdery mildew. Remove and destroy all infected plant parts, especially yellow leaves and those that are mostly covered by the white spores. Because powdery mildew favors young, succulent growth, don’t fertilize until the problem is corrected. Try to water infected plants at ground level to keep leaves as dry as possible. follow the label instructions for both implementation and the waiting period before harvest. 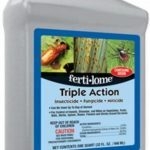 Organic controls – Early prevention is best done with Triple Action organic spray by Fertilome. Spraying an infested plant with this neem-based liquid not only kills that specific spore and prevents its spread, it also eliminates small insects like aphids, thrips, and mealybugs. Edibles coated in white mildew will need something stronger. 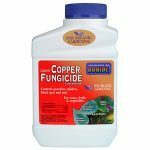 Clean up yellowed, infected leaves of fruit and vegetable plants as best you can, then spray with 100% organic ‘Copper Fungicide’. It may be applied moments before harvest. fungicide you can buy over the counter. 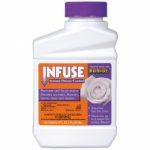 Use it on plants like roses, lilacs, vincas, and privets for quick relief. Be aware that it is not rated for garden edibles. If you just aren’t sure about treating powdery mildew, consult one of the plant experts here at Watters Garden Center. All products mentioned in this article are available here at the garden center with a knowledgeable staff on hand to guide you in their use. Until next week, I’ll be helping local gardeners with plant problems here at Watters Garden Center.